All the things in the expanded mode have to get back into the internal mode and merge in Brahman. That is ascent (ArohaNam). The descent of jIvas and the universe from Brahman is avarohaNam. The terms ‘expansion’ and ‘merging’ seem to be better. Expansion of Brahman is Evolution and the merging into Brahman is ‘Involution’. 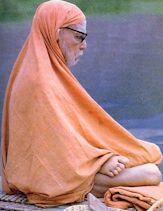 All of us have evolved from Brahman; not by ourselves but by the Will and Action of ambaal. We cannot involve into Brahman except by Her Will and Grace. Even though, in her cosmic Play, She seems to have given us a role for ourselves, we can never complete the ‘Involution’ without Her Grace. The electrical switch makes the fan rotate. Only the same switch can stop it from rotating. Thus the same Cause which made us evolve has to work again to make us involute into Brahman. So we have to pray to Her. This is where bhakti, jnAna and yoga come in.